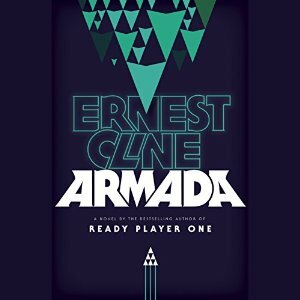 When I found out that Ernest Cline was coming out with another book, and it was also going to be narrated by Wil Wheaton (like his first book, Ready Player One, was), I was super excited. So of course I put that on my TBR immediately. And I finally had the chance to listen to the sci-fi book a few weeks ago. The basic plot is this: Zach Lightman, a typical 18-year-old, sees something out the window of his classroom that can't possibly be real: a fighter ship from the alien videogame he plays every night, Armada. Soon he finds out that this craft is all too real, and because he is one of the top-ranked players in the world, he is recruited into the Earth Defense Alliance as a pilot. What follows is your basic hostile alien story. I was kind of disappointed in the book itself. It wasn't terribly original, and I thought characters could have been better developed, especially secondary characters. The ending was kind if interesting, and it makes me wonder if Cline has a sequel in the works. Cline really likes the deus ex machina in his stuff; everything isn't happy by a long shot, but there were a lot of convenient things that happen. It was still fun though. I enjoyed all of the references to different pop culture alien stories, and Cline writes with a lot of humor, which Wheaton delivers extremely well. As always, Wheaton's narration is on point. I loved listening to him tell me this story, even if the actual story wasn't my favorite. Plus he does voices, like Yoda, so bonus. Disclaimer: I got this audiobook using my free trail for Audible.com. Sounds like a good plot with a game player recruited to fight the aliens. Interesting premise. Sounds like fantasy of a true gamer.